Bengaluru: BJP leader and Bellary’s mining baron Gali Janardhan Reddy is absconding after Police launched a lookout to arrest the tainted businessman, for his alleged involvement in the multi-crore Ambidant Ponzi scam. 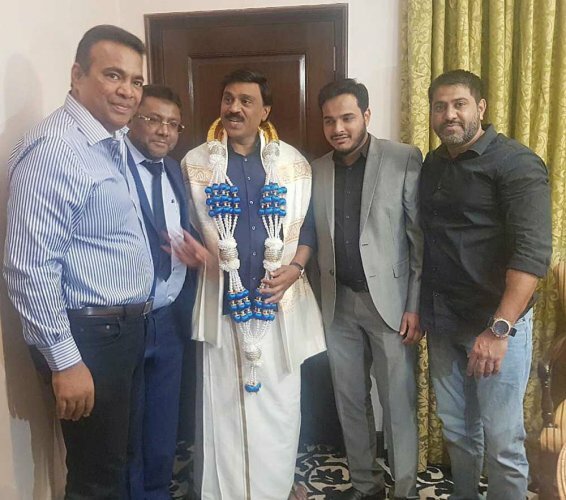 The case against him states that Reddy’s personal assistant Ali Khan allegedly received 57 Kilos of Gold Bars (worth Rs 18 crore) from Ambidant Marketing – a Bengaluru-based company, to save it from Enforcement Directorate (ED). BJP leader Gali Janardhan Reddy, with Ambidant founders Syed Fareed Ahmed and Syed Afaq Ahmed. Ambidant Marketing, which was established by father and son duo Syed Ahmed Fareed and Syed Ahmed Afaq is alleged to have amassed vast sums of money by specifically targeting the city’s Muslim community in the name of Halal investment. The company lured investors with hefty monthly fixed returns and even promised to double the amount within a few months. Police had started an investigation into the company, after hundreds of duped investors held a protest in Freedom Park in November 2017. Ambidant is not the first company, which under the garb of halal investments has duped gullible people of large sums of money. The extent of Ambidant’s fraud is yet to be ascertained.